The following is part of an ongoing series by Dr. Norman McCrummen. We’ll be publishing another one of his reasons every week, so stay tuned! For the introduction to the series, click here. 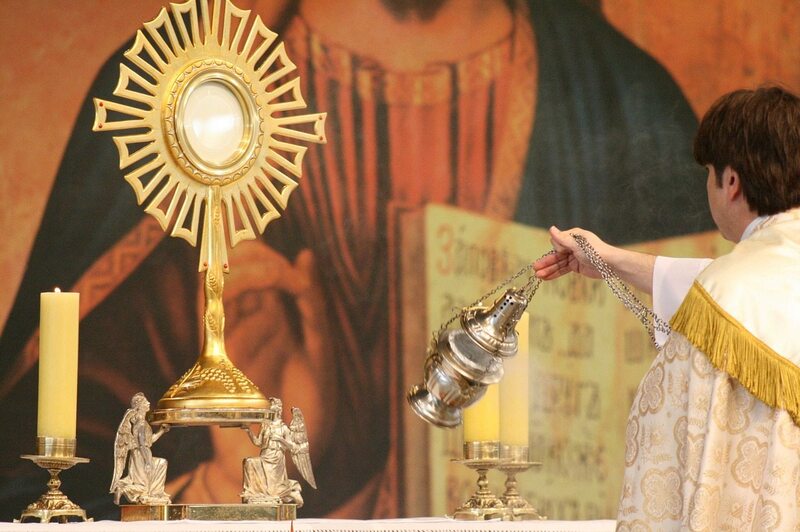 I am Catholic because I believe in the Real Presence of Jesus in the Eucharist. I take literally the words of Christ as found in the sixth chapter of the Fourth Gospel. Since the time of the apostles there was never an era when the Church failed to take literally the words of Jesus regarding the Eucharist until the Protestant Reformation. That the truth of Jesus’ words was denied by many Reformers opened the door to what eventually became a radical re-visioning and re-writing of Christianity, the effects of which surround us, from the corruption of culture to the sharp decline of Christianity in Europe. The decline did not begin immediately with the Reformation. Protestantism initially gave the world an enormous spiritual and social boost. Out of the Reformation came healthy changes in the way people began to see one another and the possibilities for a better life. “The Protestant work ethic” emerged as a new layer in the foundation of modern Western civilization. A spiritual and social awakening followed revivals in England and America which ultimately benefitted many nations. So what was the problem? The problem was that the seeds of extreme individualism were planted with the Reformation, the seeds holding self to be the arbiter of all things temporal and spiritual. 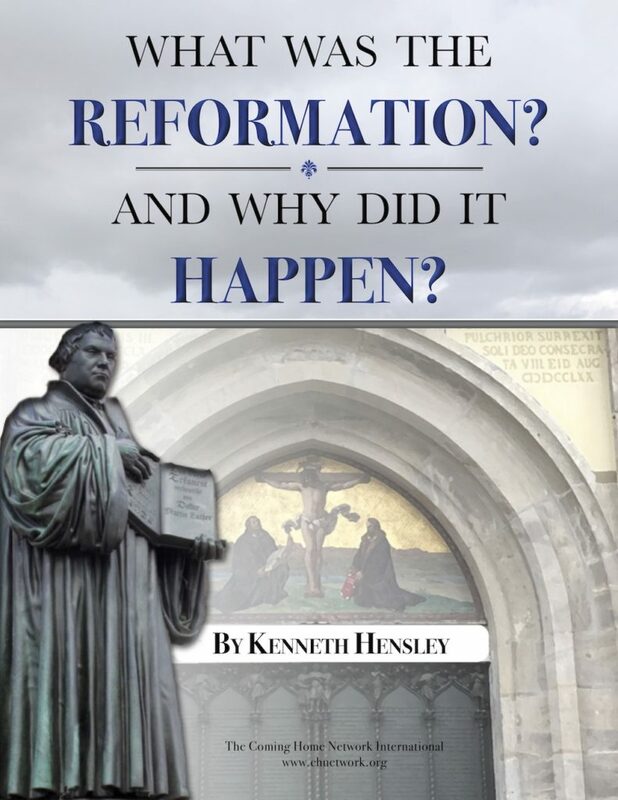 From those early Reformation seeds eventually came unitarianism, de jure and de facto, and a replacement of the Gospel with a religion of sentimentality and self-affirmation. Of course there were and are many notable exceptions. One has only to remember the orthodoxy and self-relinquishment of Jonathan Edwards, John Wesley, Dietrich Bonhoeffer, Karl Barth, Corrie ten Boom and Billy Graham and countless others to be assured that Protestantism is not entirely a matter of self-as-supreme arbiter, or for that matter, “cafeteria religion: pick and choose what is easily digestible.” Protestants have an impressive gallery of orthodox theologians and courageous martyrs which no Catholic should forget. But what is sad is the difficulty orthodox Protestants have accepting the words of Christ in the sixth chapter of John’s Gospel as Jesus meant them to be understood, an understanding which can be grasped by examining carefully (in the Greek) the word He used for ‘eat’ and the repetitive insistence that to have ‘life’ and ‘life eternal’ one must “eat my flesh and drink my blood.” On the one hand, orthodox Protestants believe God is the Creator of all that is seen and unseen; that God the Son became flesh (through Mary) in Jesus; that on the Cross the Incarnate God became the atonement for humanity’s sins; that He truly died and was buried and rose on the third day; that He ascended into heaven, and that He will come again in glory to judge the living and the dead. They believe all these amazing miracles, and yet the majority of Protestants choose not to believe what Jesus said regarding the necessity of receiving His flesh and blood. To put the dilemma in the form of a question: If one believes in the miracles of creation, incarnation, atonement, resurrection, and ascension, why can one not accept the miracle of the Real Presence? For many Protestants (how many I couldn’t know) it may be that “it sounds like Catholicism.” And it is Catholicism because it is the teaching of the universal (catholic) Church since its founding. It is what Jesus taught, and thus what the apostles and the early Fathers taught. Parenthetically: Until I began to grasp something of the chasm between Catholicism and Protestantism, I had not dealt with several mysteries from my youth, such as why some Protestant churches have no cross in them (too Catholic) or why liturgy is spurned (too Catholic) or why the Lord’s Supper is not administered weekly (too Catholic) or why Mary is never mentioned except at Christmas (too Catholic). It was startling to understand that in separating itself from everything that seemed Catholic, the Protestant tradition was stating that the Mother Church, from which obviously Protestantism sprang, had nothing to teach her children; nor were her children in any way indebted to her, not even for the Scriptures which the Catholic Church received, treasured, copied, taught, preached, and finally compiled into what we call the New Testament. Yet in that strange mix of ignorance and denial, I – like millions of Protestant young people in America – grew up learning from Sunday School teachers to take the words of Jesus literally, except when it came to the sixth chapter of John’s Gospel; although I must say I never once heard a teacher tell us, “You mustn’t literally believe the sixth chapter of John’s Gospel.” What I heard many times was that the Lord’s Supper was a memorial meal. Period. What a strange turn it was that the instruction I received so many years ago regarding the infallibility of Scripture eventually led me to accept what Jesus said concerning His body and blood in the Eucharist. I’m reminded at this point that I am indescribably fortunate to be the son of parents who taught their children that Jesus was the Word made flesh and that His incarnation in some mysterious way continues when the Word is received with mind and heart and put into action. But it was rather on my own (while not forgetting the indispensable role of the Spirit) that I came to understand that Jesus literally meant what He said as recorded in John chapter six. In the same way, it took me many years to understand that Jesus literally meant, as recorded in Matthew chapter 25, that He is indeed mystically and thoroughly in the needy who receive from charitable hands food when hungry, water when thirsty, shelter when homeless, clothing when naked, help when sick, and company when imprisoned. I am extraordinarily grateful for the journey of faith that took me to the acceptance of Jesus’ words: “Whoever eats my flesh and drinks my blood has eternal life.” I remember when those words struck me with the force of lightning: Transubstantiation. Too difficult to accept? Then I remembered: creation, incarnation, atonement, resurrection, ascension. Nothing has ever been beyond the power of the Triune God. I can’t leave this discussion of the Eucharist without acknowledging that God drew me into the Catholic Church because He knew how great would be my need for receiving His Son through frequent Communion. In 2007 my wife was diagnosed with an early onset of Alzheimer’s. In 2011, when my wife’s disease began to accelerate, my mother began having TIAs which led to dementia. The overseeing of their care became my vocation. I was to learn how draining grief can be when caring for loved ones who have lost their mental alertness. I don’t think it’s possible to understand this form of grief and exhaustion unless one has been there; by that I mean has lived with a person with dementia. What God graciously provides me, and all persons blessed to be in His Son’s Church, is the gift of Jesus in the Blessed Sacrament. The wealth of this grace is beyond measure. During Mass I receive the Word Written, read and proclaimed, and the Word Incarnate in the Eucharist. These are the Father’s gifts, and, of course, He foresaw how badly I would need them. Through His amazing providence He found a home for my family and me four blocks from Saint Ignatius Church when we moved to Mobile, Alabama in 1999, though we moved to Mobile for me to be the senior pastor of a Presbyterian church where I served for twelve years. One may wonder how I dealt with my changing beliefs about the Eucharist while serving as a Presbyterian pastor. For most of my years as a pastor I accepted the Reformed teaching regarding the Lord’s Supper: that it was more than a memorial meal; that Jesus was literally present at the Table serving as host, but the persons receiving the elements received them with nothing extraordinary happening to the bread and wine. As a Presbyterian pastor I prayed that every person receiving Communion would sense the presence of Jesus in a remarkable way, but not in the elements themselves; but, as I’ve already indicated, my belief did not remain in that particular hope. Over several years I came to believe there was more to be offered and more to be received. At least two years before my resignation and retirement, I began to feel awkward when presiding at the Lord’s Table. The awkwardness came with the awareness that what Christ intended for communicants was a transformative grace, something beyond what Reformed doctrine held and beyond what I too was conveying by being, seemingly, in agreement with that doctrine. A year before my resignation, I preached a sermon on the seriousness required to receive Communion properly. Afterwards a woman told me she would never again approach Communion with the casualness that she had previously brought to the Table. She and her husband are today Catholic. My point is: The Lord prepares us to accept His gifts for what they truly are before we realize how badly we need them. He knows perfectly our future needs, and therefore lovingly prepares us to receive from Him exceptional graces when injured by life. My present circumstances are challenging enough with receiving Jesus in the Eucharist. I cannot imagine how poorly I would bear my lot were it not for the Eucharist.